Please register for the summer school until August 27th! From the 3rd to 7th September the Europa Universität Flensburg will host a summer school on "Energy System Modelling – Setting the Interdisciplinary Stage". The summer school is part of the training within the EU-funded Marie Curie Innovative Training Network ENSYSTRA (for more information see: www.ensystra.eu). The summer school is designed for researchers at an early stage of their PhD projects and will bring together researchers in the field of energy system modelling and analysis. Due to the different backgrounds of the ENSYSTRA PhDs the aim of the summer school is to create an interdisciplinary understanding of energy modelling and establish a collaboration. 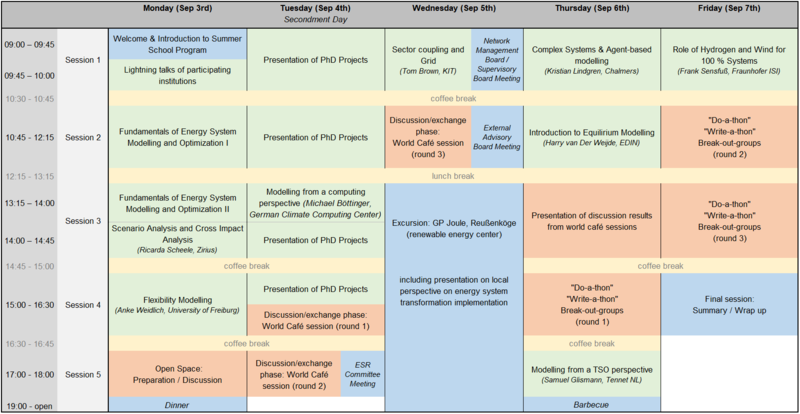 Besides different lectures ranging from the "Fundamentals of Energy System Modelling" to advanced modelling techniques, the programme will focus on practical work of the PhDs and exchange with different experts. Therefore, lectures will be supplemented by open spaces for group work and discussions on relevant topics in the field of energy system modelling. The week will be framed by different social events to create room for networking with project partners and external participants. Note: On Tuesday evening (Sept 4th) and Wednesday morning (Sept 5th) we will have committee and board meetings respectively parallel to the summer school programme. The summer school will take place on the campus of the Europa-Universität Flensburg. More specifically in the building "HELSINKI" (Google Map). On the left hand side you will find the Helsinki Building of the University. Parking is available around the building. There are multiple lodging options in Flensburg, a city with many visitors. Free cancellation until four weeks ahead of your stay, otherwise 80% of the cost have to be paid. Note: This is not a discount code but a reminder for the hotel to use the reserved rooms. Additionally, a lot o flats for (short-term) rent are also available in Flensburg, many of them in beautiful old renovated buildings in the city center.